David Heffering said his first reaction upon hearing the news that late great pacing stallion Mach Three was a first-ballot Canadian Hall of Famer was incredible joy for the Muscara family that owned the horse that died tragically in January of 2017. Mach Three — the sire of the legendary Hall of Fame racehorse and stallion Somebeachsomewhere ($3.2 million, 1:46.4 world record) — died Jan. 20 at Alabar Farms in Waiau Pa, New Zealand following a paddock accident. He had just turned 18. Mach Three suffered a broken leg in his paddock and had to be put down. Mach Three, a son of Matts Scooter out of All Included, has produced 1,320 offspring to date, with total progeny earnings of nearly $110 million by the time of his induction. The stallion produced 318 horses that earned $100,000 or more and 116 that made more than $250,000. He produced 464 horses than had a 1:55 mile, 290 that had a 1:53 mark and 32 that had a sub-1:50 mile. Mach Three’s six richest offspring are: Somebeachsomewhere ($3.2 million), Monkey On My Wheel ($1.7 million), Mach It So ($1.68 million), Solar Sister ($1 million) and Camaes Fellow ($985,000) and Down Under wonder Auckland Reactor N ($966,000). The late Joe Muscara, Sr. of Huntingdon Valley, PA purchased Mach Three in May of the pacer’s sophomore season from Linda Magid of Cambridge, ON, the widow of the pacer’s breeder, Karl Magid. Karl was perhaps best known for founding the famed Lulu’s Roadhouse in Kitchener, ON in 1984. Lulu’s, which Karl owned until 1987, was a mammoth nightclub that occupied the site of a former K-Mart and once was home to the world’s longest bar. It was also a frequent stop for some of the world’s most successful popular music acts. Mach Three posted a record of 7-2-0 in nine starts at two in 2001 and won the $1.1 million Metro Pace at Woodbine in 1:51.4 while under the tutelage of Brett, Shawn and Bill Robinson, along with Monte Gelrod. The Metro victory came seven months after Karl Magid died of cancer. 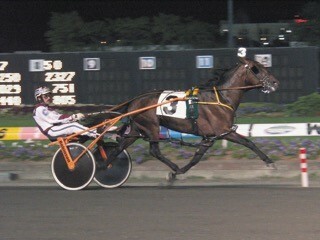 The following year, Mach Three won the $1 million Meadowlands Pace in a career best 1:49. At three, Mach Three had a record of 11-2-2 in 18 starts to give him a career record of 18-4-2 in 27 starts and earnings of $2,376,700. Mach Three was predominantly driven by Randy Waples at two and John Campbell at three. Mach Three stood his entire career at Tara Hills Stud in the northern hemisphere and Alabar in the southern hemisphere. His first foals hit the ground in 2004. Heffering said Mach Three is the fourth Hall of Fame member tied to Tara Hills Stud, including his late father, Peter Heffering, the Tara Hills founder that was inducted as a builder in 2010. Tara Hills now has had three stallions inducted, counting Mach Three. Kadabra was enshrined in 2012 and Precious Bunny was inducted in 2004.